At my wife's urging, I have embarked on the Whole30 diet. We are doing it together. Marlene has been through the Whole30 diet before. She lost weight and she felt better. It certainly wouldn't hurt me to lose a few pounds, but it is the the health-maintaining and health-improving aspects of this diet that appeal to me more than anything. At 60 years of age, I am healthy. Or, I should say, I am healthy as far as a know. I have not been to a doctor for decades. I have not had a physical exam since I was 18 years old. But I am feeling the effects of my age. There is a decline in vitality, and my capacity for physical work seems greatly diminished. There are little aches and pains; little concerns that come and go. And I am seeing people all around me (my age and younger) dealing with serious health afflictions. Being mindful of what I eat, and how I take care of the body God has entrusted to me (for awhile) is just being responsible. I feel convicted that I need to be more responsible. There are so many amazing testimonials of improved health with this diet that it deserves more attention. We have a friend who has lost 80 pounds and has experienced remarkable healing in her body as a result of this diet. She is not just following it for 30 days. She is on a Whole365. I am now five days into the diet. At this point, according to the calendar below, I'm supposed to be feeling a little cranky. But I'm not. So far, so good. In the words of Rocky Balboa, "Ain't so bad!" It helps immensely that my wife is something of an expert on this diet, having read the book, and much more. And she is willing to invest the time in preparing the right foods. Marlene tells me what I can and can not eat. She is my Whole30 coach. And we're in this together. No legumes (including peanut butter). We eat three meals a day. Each meal has a protein (eggs or meat), a good fat (ghee, avocado oil, coconut oil, olives, or avocado), lots of vegetables. Fruit is allowed, but not fruit juices. Snacking between meals is frowned on. You can eat all you want of the approved foods at each meal. If you have read my Minibed Gardening Report, you know that Marlene and I started roasting vegetables last year (when she was on the Whole30 diet). This may be the best part of the diet. 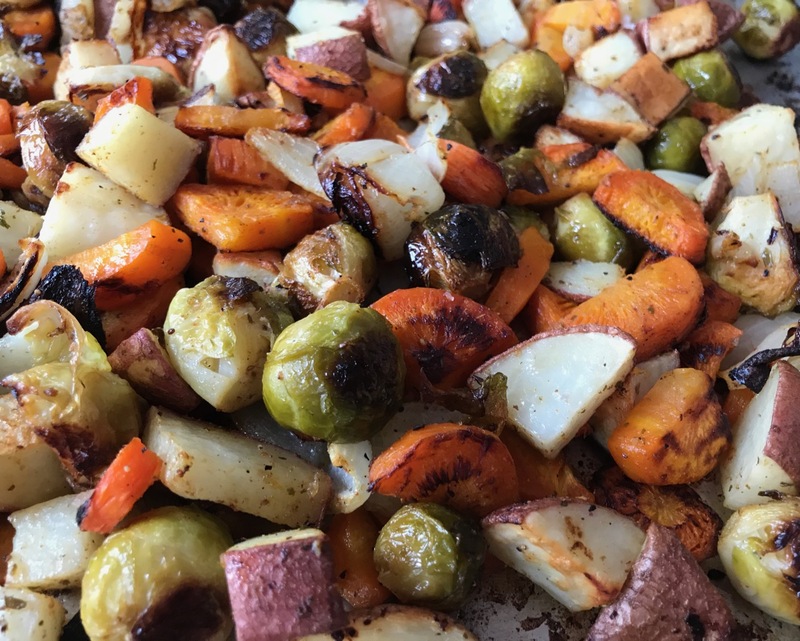 We are now huge fans of oven roasted vegetables, breakfast, lunch and supper! The hardest part of Whole 30 for me (so far) is the coffee. Although coffee is allowed in moderation (before noon), sweetener is not. For the past six years I have treated myself to a morning cup of what I call "special coffee." It is a mix of coffee, heavy cream, maple syrup, cinnamon, and coconut oil. In recent months I started adding a pinch of diatomaceous earth. I whizz the mixture to a satisfying froth in a Magic Bullet. It is soooo good! Black coffee is not so good. But my mother always drank her coffee black. It can be done. "Ain't so bad!" 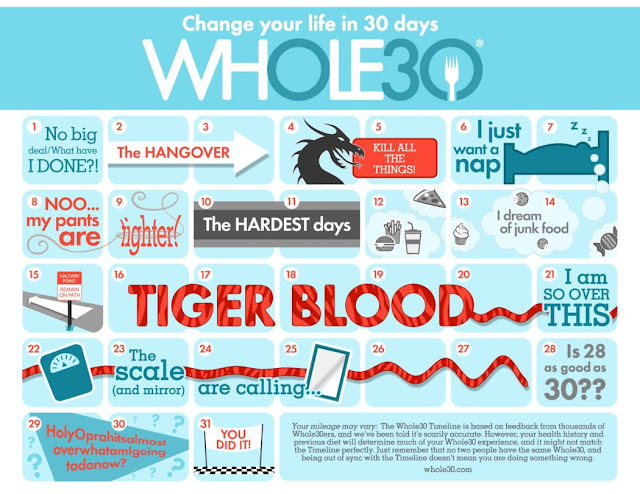 According to the Whole30 calendar (see above) "The Hardest Days" are ahead of me. But 11 days from now, I get "Tiger Blood." I'm not exactly sure what tiger blood means, but I think it is a good thing. I'm pleased to report that I have finally started planting my garden. This year, pretty much all of my garden will be grown in Minibeds. 78% less weeding, no watering, no rototilling, and focused, high culture in manageable, 6-square foot beds worked very well last year. My wife says it was the best garden I ever grew, and I've been growing gardens for the 37 years of our marriage. 2018 will be year #2 with the Minibed Experimental Garden. But my results growing potatoes in minibeds last year was only partially satisfying. Although my Onaway potato minibed was a superstar (see ThisYouTube Video), the others were not. This year I'm anxious to see if I can improve my yield, while experimenting with some new potato varieties. Now, mind you, Minibeds are not suited for growing a winter's supply of spuds. 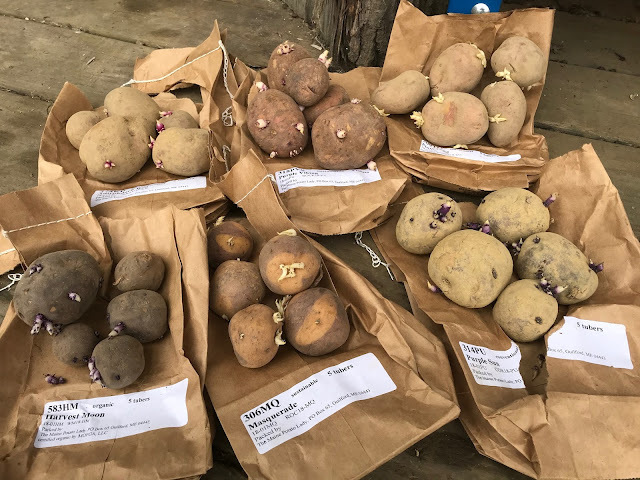 They are, however, ideal for growing some potatoes for fresh eating through the summer, and they are ideal for trialing some new varieties. After all, part of the joy of gardening is trying new varieties. It is with trialing potatoes in mind that Maine Potato Lady offers a Purple and Red Trial Collection of seed potatoes. 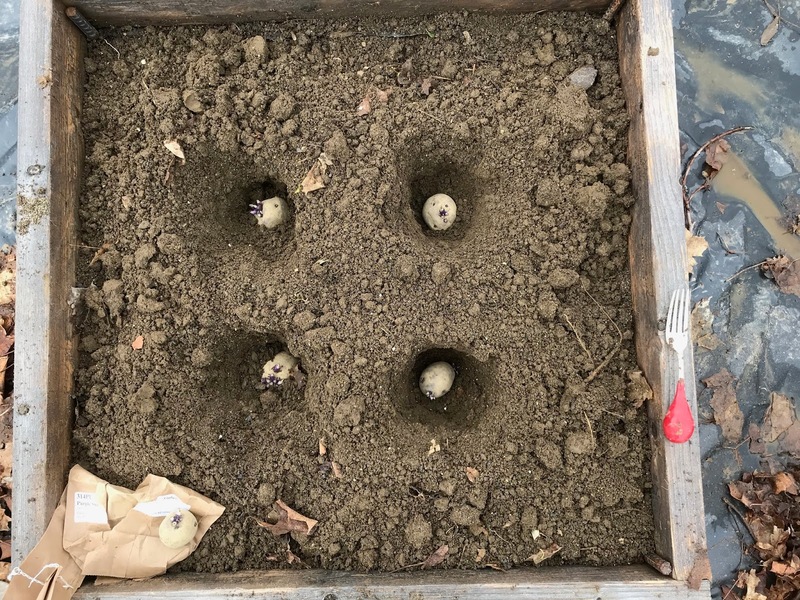 Five seed potatoes of six varieties, as you can see in the photo above (click the photo for a closer look). All the seed potatoes got here over a week ago. I put them in a warmish spot and they started to sprout, which is a desirable result. Seeing the sprouts allowed me to position the tubers just right for growth (sprouts up). They are 4" to 5" deep. 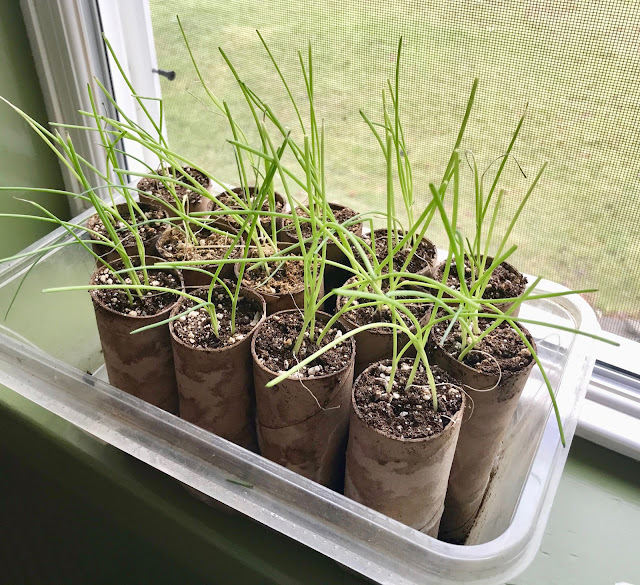 I filled them with a couple inches of soil. I'll fill the depressions in more as the plants emerge and grow. 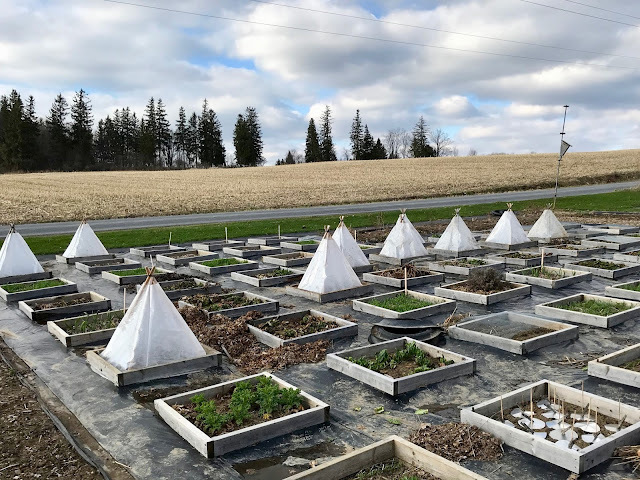 The 10 cloched Minibeds that you see are all planted to potatoes—8 different varieties. I have some Kennebeck and Yukon Gold potatoes yet to plant. They will go into rows outside the Minibed garden. 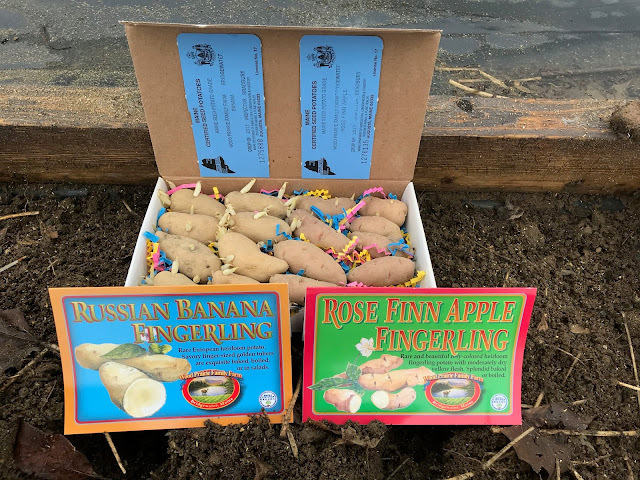 It was overcast, cool and dreary outdoors today, but I feel good about having those potatoes planted. I also planted parsnips, parsley, beets, and Romaine Lettuce. How is your garden coming along? Snow and cold are persisting here. I've been dealing with an annoying cough for two weeks. but it is waning. Not much new to report. The little peat pots were not providing the growing plants with enough root space, so I filled some toilet paper tubes with potting soil (mixed with a little alfalfa meal) and set the peat pots into the top. They fit just right, and the onion plants perked right up. It's supposed to warm up next week. I hope to get the onions planted soon. And there is much more to do.... once it warms up! The short video above provides a rare look into the old S.L. 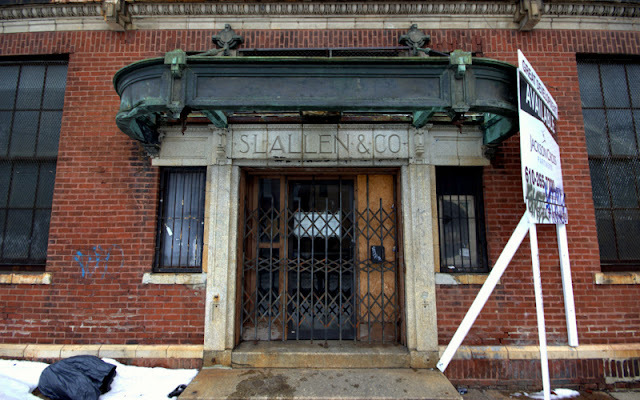 Allen factory in Philadelphia, which I mentioned (and showed a photo of) in Yesterday's Blog Post. 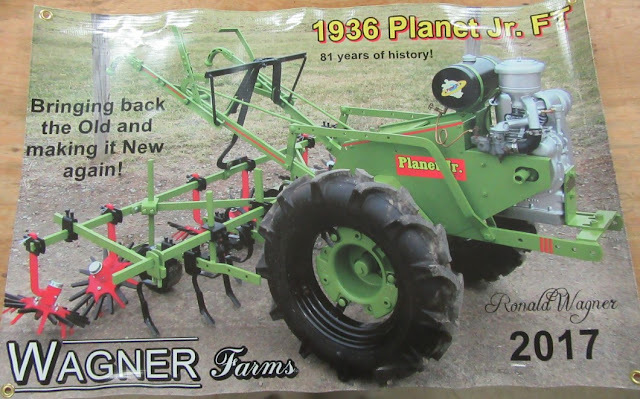 It shows not only Flexible Flyer sleds being made, but Planet Jr. planters, and walk-behind tractors too. The company even made snow skis. The film provides a historical glimpse into a bygone era. America was once a country full of people who made things and, for the most part, made things to last (planned obsolescence was surely not something that S.L. Allen believed in). I think that hands-on work-making-things is the next best thing to hands-on-work-growing-things. But now, most Americans don't grow or make much of anything with their hands. They sit at cubicles and "work" on keyboards. Or they push buttons on machines and watch the machines do the work that humans once had more of a hand in doing. The bottom line is that we all do what we have to do to provide for ourselves and our families in the techno-culture we live in. But there is surely a richness and satisfaction in life that comes with hand-work, and creativity outside of the modern paradigm. If we can't find this satisfaction in our daily livelihood, we can at least pursue it at home, on our own time. But the culture we live in seeks to dominate and consume our spare time with an endless stream of entertainment, amusements, and techno-gadgetry. Such things are a cheap substitute for actually doing something constructive and creative. I hope I'm wrong, but I sense that many of the younger generation today are missing out on this important aspect of life. Probably every older generation going back to the earliest days of the industrial revolution have thought and said the same thing of the younger generation. I've written about Samuel Leeds Allen in the past. He's the man who started the Planet Jr. company. This Essay In Particular is one I like because I shared some of the "Precepts of Samuel L. Allen," and they are very good precepts. I admire Samuel L. Allen for his character, his inventiveness and for building a company that was known for treating its workers very well. Allen's unusual Planet Jr. name and logo was the inspiration for my equally unusual Planet Whizbang name and logo, which came about after I invented a wheel hoe design back in May of 2009. I Tell The Story Of The Logo Here. And you can learn all about my Planet Whizbang Wheel Hoe Here. Since I first wrote about Planet Jr. and S.L. Allen back in 2009, interest in his company and the Planet Jr. line of tools has grown considerably. Planet Jr. wheel hoes, seeders, and ephemera can fetch big prices on Ebay. 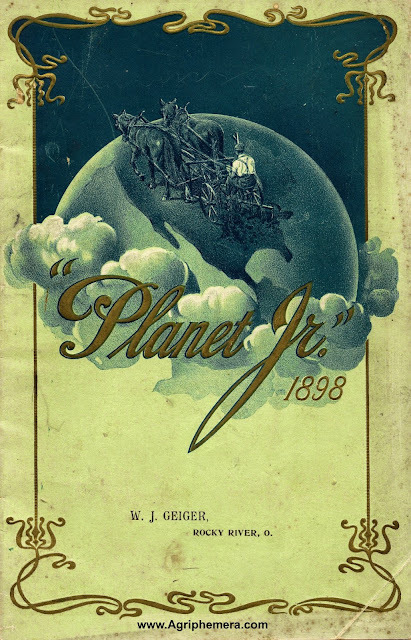 The old Planet Jr. catalogs, in particular, are sought-after collectibles. I myself sell PDF downloads of the 1898 Catalog and the 1941 Catalog. Last year, someone named S. L. Allen, IV purchased a PDF copy of one of my catalogs. I couldn't believe my eyes. S.L. Allen purchased a copy of a Planet Jr. catalog from me? I had to write this person. It turns out that Mr. Allen is a direct descendent of the S.L. Allen of Planet Jr. fame. I told him that he has a great family heritage. Sadly, I don't know of any one museum that has a very broad collection of great great grandfather's equipment. There is a nice Flexible Flyer sled display in the Moorestown Library and I know of a very early Planet seeder in a different New Jersey museum but for the most part no one has dedicated a display of any large size to the bulk of the 99 years of the company. The references you mention to the Brandywine museum I believe came from comments from my aunt Penny. But while chasing down that lead I found that while there is still something called the Brandywine museum, it is not in the same state as the one originally referenced and it is an art museum, not one housing farm equipment. The state of NJ also had a collection that was run by one of the colleges in the midstate, but that museum closed some years back and they reportedly gave all of the equipment back to whomever leant it in the first place. Thus, I'm sorry to say, there is no Planet Jr. museum. But there are a lot of serious collectors out there who are gathering old Planet Jr. tools. Perhaps one day it will happen. On a related note, I am personally trying to gather as much data as I can in the hopes of putting out a Planet Jr. book. I hope for it to be similar to Joan Palacia's Flexible Flyer book, but I'm still collecting, scanning and collating at this point. And while I personally own a fairly sizeable collection, I know of at least 4 people each of whom have collections that dwarf my own. One fellow has close to 50 different Planet Jr tractors, another has several hundred seeders, etc. It is my hope to work with them to help me with images for the book. I suspect I'm over a year away from completing the research though- I still need to scan several hundred more parts lists, manuals, ledgers and catalogs to have the base from which I begin the real work! A lot of people are not aware that Planet Jr. made motorized, walk-behind tractors with all kinds of implements. 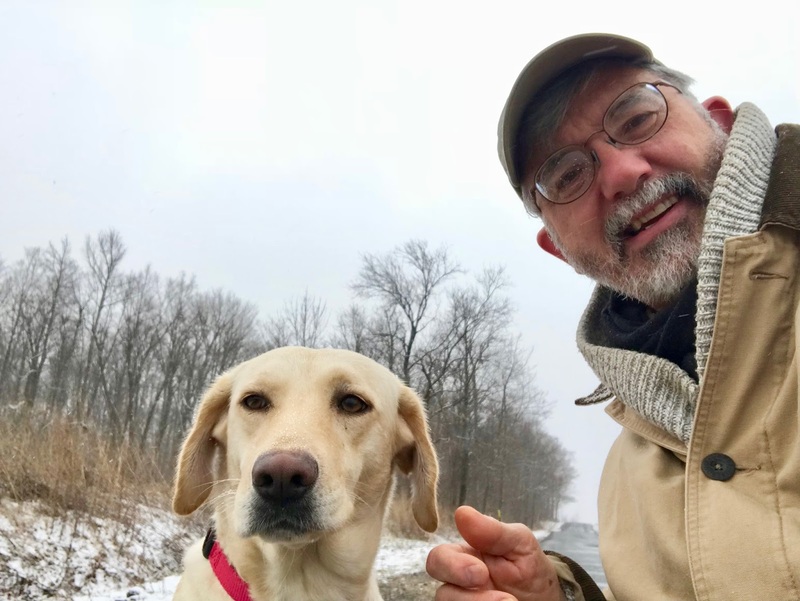 Check Out This Link to learn about a guy who is farming with restored Planet Jr. walk-behind tractors. If you are interested in the history of Planet Jr. and the company that produced Planet Jr. tools, be sure to check out This Story about the old S.L Allen Factory in Philadelphia. 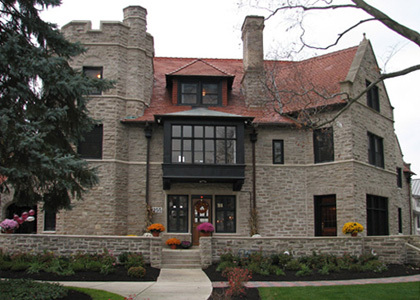 Fortunately, the remarkable home that S.L. Allen built in 1894 is in better shape than the factory. You can learn more about it At This Link. Lacking a museum to visit, I'm really looking forward to Mr. Allen's Planet Jr. book. I'll be purchasing a copy, for sure. And I'll let you know all about it here when the time comes. I'm sorry to see that the frog has been boiled in Quebec, Canada. "You must join the collective, Comrade. You have no choice in this matter. After all, it is for your own good. If you do not play by our rules, we will destroy you." My mother's maiden name was Philbrick. She told me that Herbert Philbrick was a relative. I think she knew the genealogical connection (some sort of cousin). Herbert Philbrick was famous for infiltrating organized Communist activities in the United States (as the article excerpt below explains). People these days look back at the "Red Scare" of the late 1940s and 1950s and think of Senator Joe McCarthy's claims that Communists had infiltrated American politics, as well as other influential cultural institutions, like universities and the media. McCarthy's Senate investigation into Communist activities is most often portrayed as a witch hunt that ruined the careers of many innocent Americans. A new word, McCarthyism, came into the dictionaries shortly thereafter: "The practice of making accusations of disloyalty, especially of pro-Communist activity, in many instances unsupported by proof or based on slight, doubtful, or irrelevant evidence." His name today sounds vaguely familiar, an echo from nearly half a century ago, a time when fear of Communism gripped America. 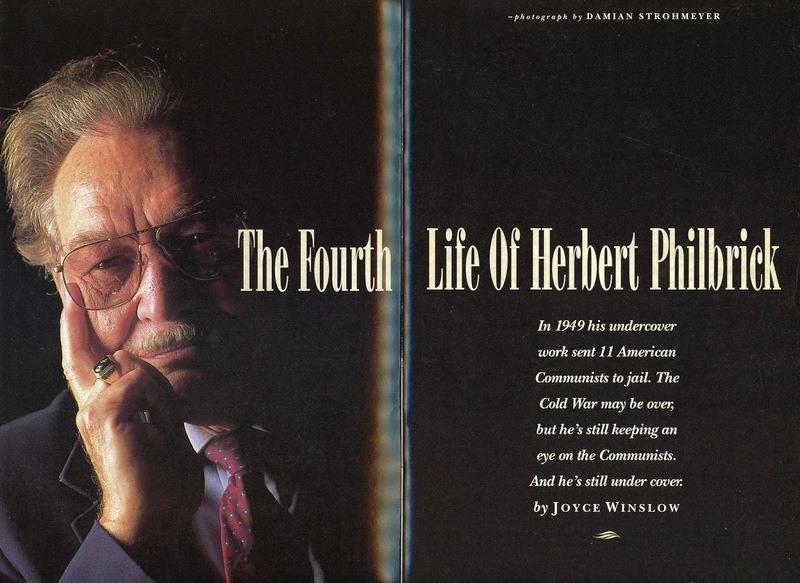 From 1940 to 1949 Herbert A. Philbrick led three lives. In one of them, he lived in the suburbs of Boston, taught Sunday school at the neighborhood Baptist church, worked as a press agent for the New England office of Paramount Pictures. In a second, secret life he was a dedicated Communist conspirator who attended cell meetings in Beacon Hill, demonstrated against the government, and was twice arrested. His third and most secret life ended on April 6, 1949. In the spring of that year federal authorities charged 11 top American Communists with conspiring to advocate the forcible overthrow of the U.S. government, a violation of the Smith Act. The trial in Manhattan's Federal Court quickly became one of the most controversial in American history. On the tenth day of the trial the prosecution called 33-year-old Herb Philbrick to the witness stand. He was dressed in a a suit with a red-white-and-blue tie, and he told the packed courtroom he had been a member of the Communist Party. Then he stunned the defendants. "During the entire nine years of my activities," he said, "I have been continuously in touch with the FBI." Philbrick was the government's star witness. He told how he had been trained to blow up Boston bridges and railroads and disrupt communications lines. The jury found the defendants guilty. "As time went on during the nine years, as I advanced to higher levels in the party, I became aware of the absolute evil of this thing." 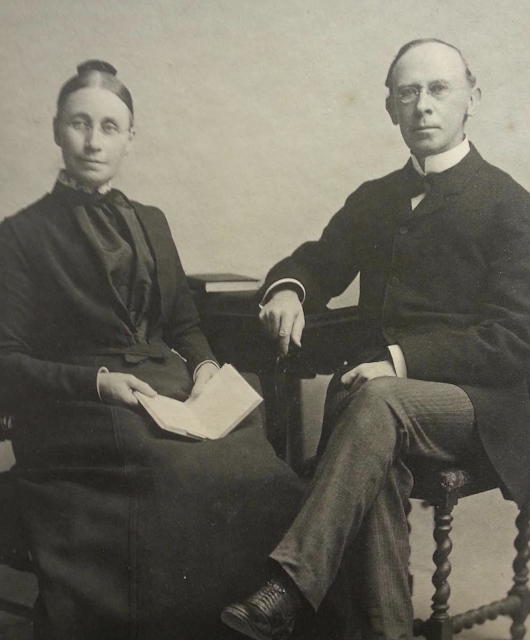 Philbrick reached the inner circle of one of the most important cells of the New England branch of the Communist Party. Meeting on Beacon Hill to discuss tactics and strategy, he worked face to face with some of the people he was later to accuse in court. "You should have seen their faces when I stepped up to the witness stand," he says, "I thought they were going to have heart attacks." Communists are professionals at duping people. Our State Department people, on the other hand, are amateurs. Put an amateur boxer into a ring with a professional prizefighter. Now this amateur may be a splendid fellow, love his mother, and go to church every Sunday. But if he gets into the ring with the professional, he's going to get his block knocked off, and that's what's happening." "According to the best estimates I've seen, about 1,000 avowed Marxists are teaching in schools and colleges today and some of them are so hateful. Their message is 'Hate America.' We keep track. I have people— for example, recently the Marxists had a weeklong conference at a Big Ten university. I can tell you everyone who was there, and what was said, and what they decided. Marxists can teach, but not me. I was banned by many universities. Maybe due to McCarthy's excesses, there's a great suspicion and fear of anyone who is anti-Communist. McCarthy damaged us with his bumbling. But he was basically right. Still, people think we're nuts and screwballs." Nuts and screwballs? For being concerned about subversive Marxist activists in America? Well, I must say, the media manipulators have done an amazing job (since McCarthy) of marginalizing any American who is concerned about any organized, subversive threat to our nation. The mainstream media are the the prizefighters that Herbert Philbrick spoke of in the above quote. And average Americans are total amateurs in the ring. Americans no longer need to understand real history and true facts in order to come to their own conclusions. The media will interpret these things for us and tell us what our opinions should be. That's the way it works. 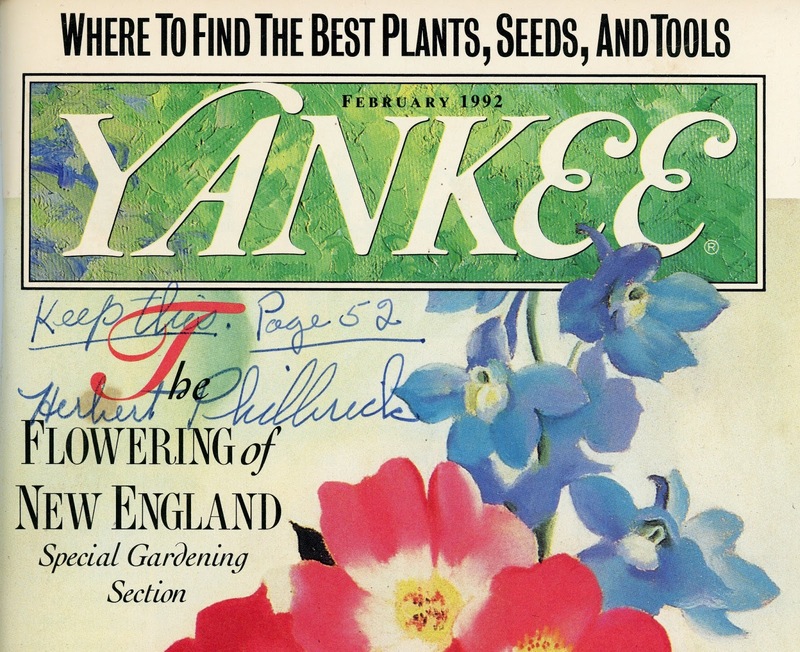 And now, 26 years after that Yankee article was published, I'll bet there are considerably more than 1,000 Marxists teaching in the schools and universities of North America. Marxism has become fashionable. College campuses are now dominated by masses of duped fellow travelers and useful idiots. Cousin Herbert died in 1993 at 78 years of age. I never knew him, but I sure do miss him. I'd like to think that there are a few Herbert Philbricks out there, infiltrating the subversive Marxist cells in America today. But I'm not optimistic about that.